When Labour’s ruling body last met two weeks ago, a new code of conduct was passed by the key sub-committee known as ‘Org Sub’. It outlined what constitutes antisemitism and what behaviour could see party members disciplined accordingly. General secretary Jennie Formby met with two representatives from the Jewish Labour Movement, the only Jewish group formally affiliated to the party, and the next day apparently reported back to national executive committee members that it had effectively been given the thumbs up. They voted unanimously in favour of the code. In the following days, however, JLM joined the Jewish Leadership Council and the Board of Deputies in criticising the new guidelines. 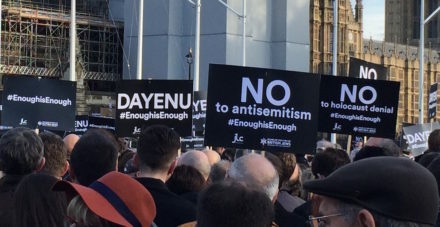 The Jewish groups specifically called the party out for failing to adopt the definition of antisemitism set out by the International Holocaust Remembrance Alliance – specifically the organisation’s full list of examples of antisemitic behaviour. And JLM said Formby should have offered “pre-sight” of the guidelines and the ability “to take them away for further discussion”. The party maintains that the new code does adopt the full definition, but the examples are in the body of the text so that the guidelines are more detailed and can be used as a practical guide. Some members of the Jewish community think that’s arrogant. Last night, after 68 rabbis registered their complaint in a letter to The Guardian, at a private meeting the Parliamentary Labour Party voted overwhelmingly in favour of adopting the full IHRA definition including all examples. The motion was proposed by Alex Sobel, an MP from the 2017 intake who is widely viewed as ‘soft left’ and not particularly factional. Just four MPs – reportedly Chris Williamson, Andy Slaughter, Grahame Morris and chair of the Palestine parliamentary group Richard Burden – voted against. Today the NEC meets again. A packed agenda will likely devote most time to discussing the democracy review proposals, but minutes of the last meeting will have to be agreed. It is thought likely that the question of whether to defer the IHRA definition decision for further consultation and work will be raised. Some NEC members agree that the issue won’t go away unless the decision is reconsidered, but they are hesitant. One pointed out that succumbing to external pressure would reflect badly on party democracy. If no movement is forthcoming, JLM warns that the matter could end up in the courts via an unprecedented formal dispute.